Influenced by traditional European designs, each knife in the Essential Collection has been optimized for kitchen use thanks to a wide blade for increased knuckle clearance, a rounded spine for comfort while using a pinch grip, and an ergonomic triple-riveted handle for secure, easy cutting. Revolutionary FC61 steel holds a screaming-sharp edge and is incredibly durable, while the brushed polymer handle, polished bolster and full-tang construction result in a perfectly balanced knife that's a joy to use. Each Essential Collection knife draws on the enormous wealth of knife-making knowledge of Seki City, Japan, and undergoes a rigorous 100-step, 42-day manufacturing process during which it passes through the hands of 45 expert artisans. As a finishing touch, each knife receives a central mosaic pin handcrafted in Bob Kramer's personal studio. 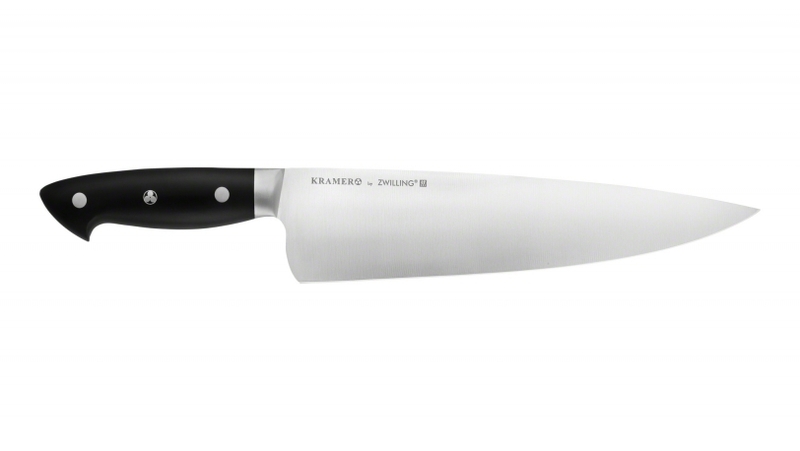 Built to withstand the pressures of everyday use in busy kitchens, this is one knife that will be with you for years to come.